Proof Brewing Company is excited to announce the grand opening of its new home in Tallahassee, Florida. The new location features expanded brewery production, quality control lab, tasting room, beer garden, private events space, and restaurant. The revitalization and move to the abandoned Coca-Cola Bottling Facility, built in 1948, began in late spring of 2018. The grand opening of the $6 million facility will be held on February 8th with the introduction of new hours of operations and brewery tours. The Tallahassee-Leon County Office of Economic Vitality (OEV) projects the move will have an estimated $23 million total economic impact on the community, creating 20 new jobs. Since 2012, Proof Brewing Co. has experienced explosive growth, producing 6000 barrels in 2018. The larger building and additional fermentation capacity will allow brewery staff to expand production of Proof Brewing Co.’s core lineup of bold and flavorful beers. La La Land West Coast-style IPA and Lager will be added to the core lineup of cans next to the wildly popular Eightfive-0 American Pale Ale and Mango Wit Belgian-Style Wit in the months following the facility’s opening. Additional package varieties will be added for the tasting room and distribution release. The inclusion of a $150,000 onsite lab and centrifuge will increase the efficiency and consistency of every beer. The new technology will significantly improve the shelf stability and production quality. The larger tasting room will feature a full bar pouring twenty-four beer taps, wine, house sangria, and hand-crafted cocktails. Brewery tours will begin in the new merchandise area where fans can access growler, crowler, and package varieties to-go. Guests can relax in the all-weathered covered patio and enjoy over 8000 square feet of beer garden space. A new private event space will offer guests a stunning atmosphere to host engagement, holiday, retirement, and birthday parties as well as corporate meetings and events, with views into the brewery and access to a private beer garden. Proof Brewing has partnered with local chefs to open a new onsite restaurant concept called Proper. Proper will also be available for catered private events and dinners in the new event space. As growth in the new facility continues, additional employees and support staff will grow when new markets are reached throughout the state of Florida and beyond. “The support we have received over the years has always exceeded our expectations. We are grateful for our local community and take pride in reinvesting back into Tallahassee. This investment provides greater customer experience through education and service while meeting the needs of production growth,” said Byron & Angela Burroughs. 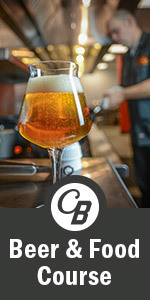 The post Proof Brewing Company To Open New Facility appeared first on CraftBeer.com.